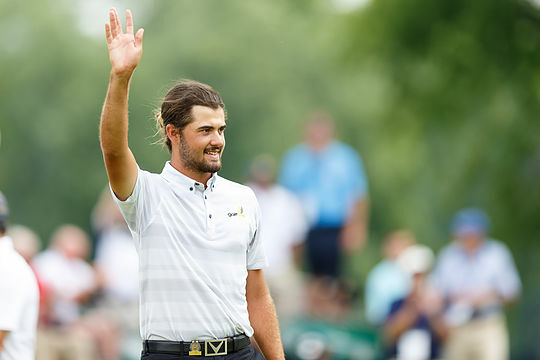 Australia’s Curtis Luck will meet American Brad Dalke in the 36-hole final match of the 116th US Amateur Championship at Oakland Hills Country Club. Luck, 20, the winner of the 2016 Western Australian Open on the Australasian Tour, defeated American Nick Carlson, 19, in 21 holes in a gripping semi-final match that had Luck nailing a number of wonderful approach shots and draining several long clutch putts. Carlson had started quickly by winning holes 2 and 3, then lost the fifth when Luck made birdie. Carlson rebounded to win the eighth with a par for another 2-up lead. Luck, No. 7 in the World Amateur Golf Ranking, responded with wins on the 10th and 11th holes to square the match. Carlson, who was playing in this first USGA championship, regained the lead with a 15-foot birdie putt set up by a superb approach shot to 2 feet. The 16th and 17th holes were halved with par and bogey, respectively. Leading 1up on 18th tee, Carlson’s drive hit a tree and finished under it, giving Luck an opportunity to pounce and the Aussie did by winning the hole. On the first extra hole, Luck, a 2014 US Junior Amateur semi-finalist, nailed a critical 3 metre par putt to hold off elimination. Both players birdied the par-4 11th after sticking their approaches within a metre. Luck, who never led until the final margin, then reached the par-5 12th hole (3rd extra Hole) in two with a 3-wood from 237 metres, which landed on the centre of the green. “I saw he obviously hit it real close in there for his second from the fairway, and it really didn’t give me any option other than to go for it and hit it close myself, so I was kind of lucky I had a perfect distance and a perfect lie in the trap,” said Luck. Following Luck’s conceded birdie putt, Carlson missed a 7 metre birdie putt to clinch the win for Luck. Luck’s opponent for the final, Dalke, won the 2015 PGA Junior National and recently finished in a tie for 40th at the Western Amateur. A member of the 2014 US Junior Ryder Cup team, Dalke is ranked 265th under the World Amateur Golf Ranking. Luck will attempt to become the third Australian to win the US Amateur, following Walter J. Travis (1900, 1901, 1903) and Nick Flanagan (2003). Both finalists, if they remain an amateur, receive an exemption from qualifying for the 2017 US Open Championship at Erin Hills next June, as well as a likely invitation to the next Masters Tournament and The Open Championship, conducted by The R&A.